The Regional Perinatal Programs of California (RPPC) evolved from the need for comprehensive, cooperative networks of public and private health care providers within geographic areas to promote the well-being of pregnant women and their babies. In the early 1980s, the California Legislature mandated the development of a statewide network of perinatal regionalization. The goal was to match the needs of high-risk perinatal patients with the appropriate type of care, by developing a multi-tiered network of care providers and facilities within specific geographic areas. Funding is provided by Federal Title V MCH Block Grant. The Regional Perinatal Programs Directors and staff provide resources, consultation, and technical assistance to hospitals and health care providers. Counties served by our RPPC program are: Del Norte, Humboldt, Mendocino, Lake, Sonoma, Napa, Marin, Contra Costa, Alameda, San Francisco, San Mateo, Santa Clara, Santa Cruz, San Luis Obispo, Monterey and San Benito. For more information, please visit RPPC. 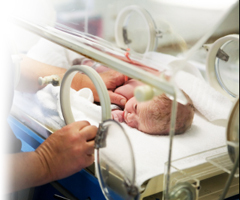 The California Perinatal Quality Care Collaborative (CPQCC) is a group of public and private, California leaders in healthcare, committed to improving care and outcomes for pregnant mothers and newborns. The Collaborative includes 126 member hospitals. These facilities care for more than 90% of all NICU admissions across the State. Our major goal is the development of a collaborative network of public and private, obstetric and neonatal providers, insurers, public health professionals and business groups, to support a system for benchmarking performance improvement activities for perinatal care throughout California. For additional information, visit CPQCC.